This is one of the amusing releases from Carlton Ware in their 'Standing Ware' series. 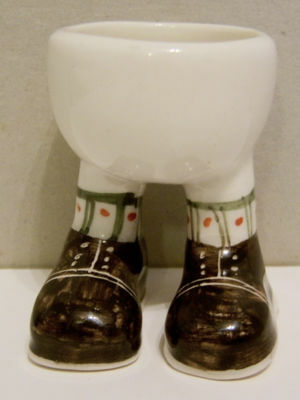 This one is an Eggcup with brown brogue-style shoes, green striped socks with red spots. One foot is backstamped with the edition number '8' (out of only 100 pieces) and Lustre Pottery's backstamp and a 'cup' drawing on the other, also indicating the date of 2007. There is some very light crazing at all and there are no chips/nibbles nor restoration work.